I spent last weekend in the Catskills with friends and made dinner for them on Saturday night. 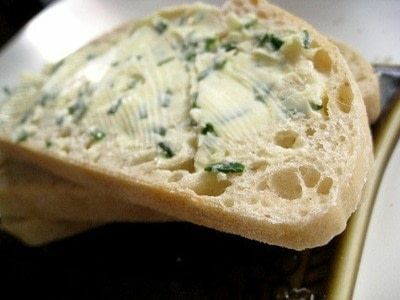 One of the things I made was this simple chive butter recipe. It's such a delicious treat for a summer lunch or dinner and it's super easy to make. Begin by setting the butter out in a medium sized mixing bowl to soften. Cut it up into smaller pieces to hasten the process. 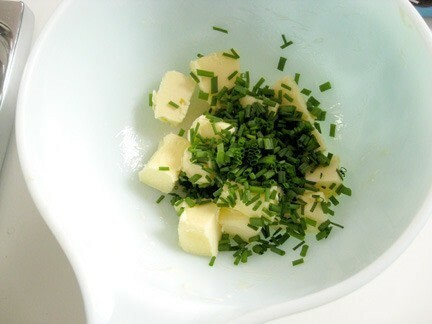 Once it's softened up nicely, cut the chives into the bowl. I find it easier to use a pair of scissors for cutting chives. Then add the lemon juice (if you don't like things quite as tart you can use half a teaspoon) and mix everything together with a fork. Once it's all well combined, remove the butter to a sheet of wax paper. Using the paper, work the lump of butter back into a stick form. It can be square or round. I chose to make a square stick. The process is a little obscene, but I'm sure some of you will enjoy that. If you're timid, you can put the butter in small ramekins. Put the butter back in the fridge to firm up. Serve with a hearty sour dough bread. 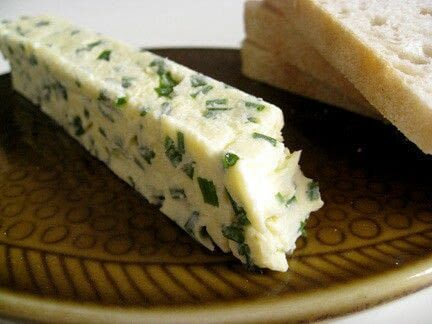 This can also be done with other herbs, and you can substitute cream cheese for butter. I love recipes like this. They add so much to a meal, but are so quick and easy to make. Enjoy!